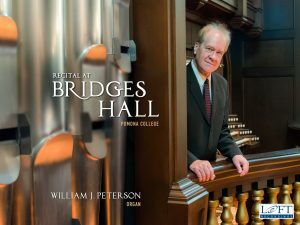 A new album of organ music performed by Professor Emeritus of Music Bill Peterson, titled “Recital at Bridges Hall, Pomona College,” has been released on CD by Loft Recordings. The album was recorded last March and features music performed on the Hill Memorial Organ in Bridges Hall of Music. 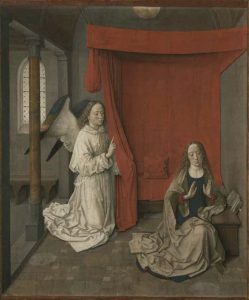 “The CD is based on a concert that I presented in February of 2018,” Peterson explains, “and there are really four areas of organ repertoire represented.” These, he said, were the music of J.S. Bach; the music of A. Guilmant, which are organ pieces from the 19th century based on vocal-music styles; three compositions published after World War I from an anthology dedicated to the “Heroes of the Great War,” and several compositions by composers with Pomona connections, including John Cage, who attended Pomona from 1928 to 1930; Professor Emeritus of Music Karl Kohn and Professor of Music Tom Flaherty. Peterson began planning the project in May 2017, working with Roger Sherman of The Gothic Catalog. In summer of the same year, he received a Sontag Fellowship, making the project possible. The album is available for purchase as CD or download on The Gothic Catalog website. Peterson retired this year as the Harry S. and Madge Rice Thatcher Professor of Music after a 39-year career at Pomona. A noted organist, he has performed in venues across the United States. The Hill Memorial Organ was designed and built by C.B. Fisk of Gloucester, Mass., and carries the designation of Fisk Op. 117. The three-manual organ was installed in the then-newly renovated Bridges Hall of Music in 2002. Alison Rose Jefferson ’80 brings the history of L.A.’s Central Avenue to life. Buildings tend to stand still. History never does. Central Avenue, the hub of Black life in Los Angeles during the Jim Crow era, is now more associated with the taquerias and vibrant Spanish-speaking community that share the sidewalks today. The Lincoln Theatre, nicknamed the “West Coast Apollo” in its heyday for hosting such performers as Count Basie, Duke Ellington, Nat “King” Cole and Billie Holiday, now hosts the congregation of the Iglesia de Jesucristo Judá. Yet at the nearby 28th Street YMCA, built in 1926, one can still glimpse the terra cotta likenesses of Booker T. Washington and Frederick Douglass in the upper corners, watching over a building that housed one of the few swimming pools where Blacks were always welcome. 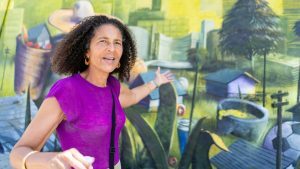 Historian Alison Rose Jefferson ’80 seeks to illuminate both the past and present of this important South L.A. neighborhood in a deeply researched walking tour she created with Angels Walk LA, a nonprofit that has produced 10 other self-guided historic trails around the city. Jefferson and collaborator Martha Groves chose an inclusive embrace, highlighting both the 27th Street Bakery – owned by 1984 Olympic sprinter Jeanette Bolden and known for its Southern sweet potato pies – and the nearby Las Palmas Carniceria, known for its chorizo. Angels Walk LA will install 15 stanchions highlighting some of the 65 sites along the trail that stretches roughly from 24th Street to Vernon Avenue later this year. They will tell the story of the neighborhood not only to those who live there but to curious visitors and the music lovers who flock to the Central Avenue Jazz Festival each July. A sociology major at Pomona College, Jefferson took an unusual academic path, returning to school to earn a master’s degree in heritage conservation from the University of Southern California in 2007 and a Ph.D. in history at UC Santa Barbara in 2015, 35 years after earning her undergraduate degree. Her goal was to enhance a career in writing and public projects that has made her a sought-after expert for documentaries and other reports. It is a role sometimes defined as a “public historian,” and just one of many career paths for history majors beyond academia. “I’ve always been interested in history,” says Jefferson, who worked for a historic preservation firm before pursuing a doctorate. But even as she devoted her days to documenting and preserving brick-and-mortar sites, Jefferson understood that history is what happens within and beyond the walls. By completing her doctorate, she acquired the training and credentials that bolster her qualifications for various efforts and grants. “With a Ph.D., I could do a broader array of projects,” Jefferson says. Among her many endeavors, she has expanded awareness of the Santa Monica beach at Bay Street that was sometimes known as the Inkwell during the era of de facto segregation in California, along with the life story of Nick Gabaldón, L.A.’s first documented surfer of African-American and Mexican-American descent. Jefferson also has an upcoming book, Leisure’s Race, Power and Place in Los Angeles and California Dreams in the Jim Crow Era, to be published by the University of Nebraska Press in late 2019. The stretch of Central Avenue that lies south of the 10 Freeway and north of Vernon is in some ways nondescript, like so many others in South Los Angeles marked by older storefronts with hand-painted signs and the occasional street vendor. But a stroll with Jefferson reveals the unseen history of the Jim Crow era and the early civil rights movement in L.A., along with the melding of the old neighborhood with the influx of Latin American immigrants. It is not merely history to Jefferson: It’s also personal: Her grandfather, Dr. Peter Price Cobbs, was a neighborhood physician for many years before his death in 1960. “My mother would bring us over here. I was little. I’d be fascinated, thinking, ‘I’m in the old neighborhood,’” Jefferson says. Besides her long familiarity with the area, Jefferson drew on her extensive previous research and writing on the Black Angeleno experience to create the Central Avenue guide with Groves, a former Los Angeles Times reporter and editor. The pair delved into archive collections, examined census records, perused old photographs, and read articles from the three newspapers that once covered the community, the California Eagle, the Los Angeles Sentinel and the Times. They also drew from books and scholarly articles. “A special treat of the research process that I enjoyed was visiting the businesses along the avenue and interviewing the owners for the information that was to go into the guidebook,” Jefferson says. Middle-class Black families flourished in the area around Central Avenue during the first half of the 20th century in what was largely a parallel society to white L.A., where Blacks faced restrictions in the workplace and community. Blacks were even limited by which homes they could buy, Jefferson notes, at least until the system of racially restrictive “covenants” in property deeds was ruled unenforceable under the 14th Amendment in the 1948 U.S. Supreme Court decision Shelley v. Kraemer. Segregation was not only a feature of the American South; it was also pervasive in L.A. The African American Firefighter Museum at historic Fire Station No. 30 on Central Avenue just north of the 10 Freeway documents the era from 1924 to 1955 when the city’s Black firefighters were allowed to serve only in two segregated fire stations, and promotions were limited. Even nightlife was affected. Central Avenue became home to the famous jazz club scene dubbed the “Brown Broadway” by the California Eagle newspaper in part because Black musicians and their fans were not welcome at all-white clubs – though whites made forays to Central Avenue to visit famous spots like Club Alabam and Jack’s Basket Room. At a time when luxury hotels would not serve Blacks, traveling musicians such as Ella Fitzgerald, Lena Horne and Louis Armstrong stayed at Central Avenue’s Dunbar Hotel, which opened in 1928 under the name Somerville Hotel just in time to host delegates to the first West Coast convention of the NAACP. Other dignitaries also stayed there, including boxer Joe Louis, poet Langston Hughes and future Supreme Court Justice Thurgood Marshall. The Dunbar still stands, with a lovely renovated courtyard, and is now part of a complex for low-income seniors and others. By the 1950s, Black families – including Jefferson’s – began to move farther south and west in the city, no longer limited to the old neighborhood. Some businesses and institutions from the earlier era still thrive, among them the Los Angeles Sentinel newspaper, which moved to Crenshaw Boulevard, and Second Baptist Church, a stately Romanesque Revival church that hosted speeches by Martin Luther King Jr. and Malcolm X. Still home to one of the most influential Black congregations in L.A., the church at 24th Street and Griffith Avenue was designed by trailblazing Black architect Paul Revere Williams and is on the National Register of Historic Places, as is his 28th Street YMCA, now housing for special needs adults and former foster youth. Along with the Angels Walk heritage trail, other efforts to revitalize the neighborhood include the Central Avenue Constituent Services Center, a strikingly contemporary building that is home to the district office of L.A. City Councilman Curren D. Price Jr. Yet the community’s most vibrant indicator of its past, present and perhaps its future might be the neighborhood’s many murals. On 42nd Place across from the Dunbar Hotel is a mural featuring such important figures as Dodgers star Jackie Robinson, Los Angeles Mayor Tom Bradley, longtime legislator Augustus F. “Gus” Hawkins and Nobel Peace Prize winner Ralph J. Bunche, whose boyhood home is on 40thPlace. Jefferson points out another mural on the side of El Montoso Market at 40th Place that pays tribute to the Latin American immigrants who now make up 75 percent of the neighborhood’s population. A man hauls a basket filled with vegetables and a depiction of a house on his back, and the L.A. skyscrapers are shown as stacks of U.S. currency. At 41st Street, another shows a black and brown hand clasped together, and above it, the words cultura cura: Culture heals. A walk, Jefferson knows, can sometimes teach more than a lecture. 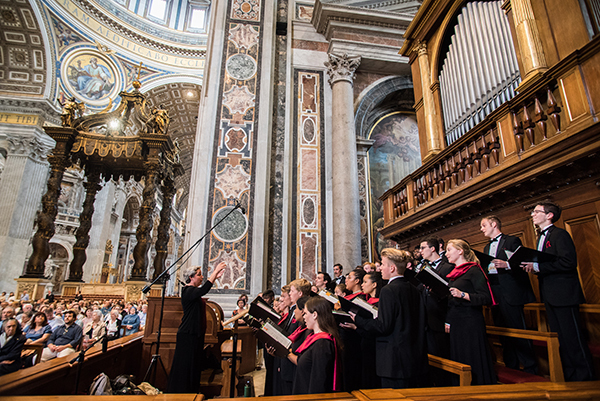 The Pomona College Glee Club, under the direction of Professor Donna Di Grazia, performs in St. Peter’s Basilica in Rome during the group’s spring tour of Italy. This May, St. Peter’s Basilica in Rome and St. Mark’s Basilica in Venice will ring with the voices of the Pomona College Glee Club, as the group brings its annual concert tour for the first time to Italy. Each year after the end of the spring semester, the Glee Club takes a little piece of Pomona on the road, performing in venues across the country and around the world. 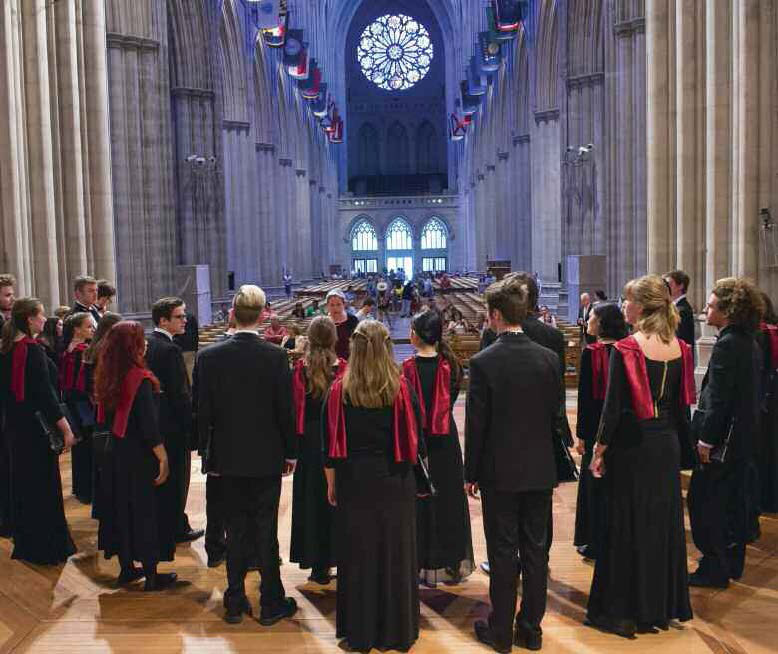 Last year’s East Coast tour included a performance at the National Cathedral in Washington, D.C. (below). The last time the troop went transatlantic was in 2012, when they performed at venues across Poland, England and Germany, including the famous Thomaskirche in Leipzig (Bach’s home church for nearly 30 years), St. James’s Piccadilly in London, and the Berliner Dom in Berlin. Basilica San Nicolo, Lecco (Lake Como region), Italy—May 19, 9 p.m.
Chiesa San Salvador, Venice, Italy—May 21, 7 p.m.
Basilica Santa Trinita, Florence, Italy—May 25, 9 p.m.
Chiesa San Marcello, Rome, Italy—May 27, 9 p.m. 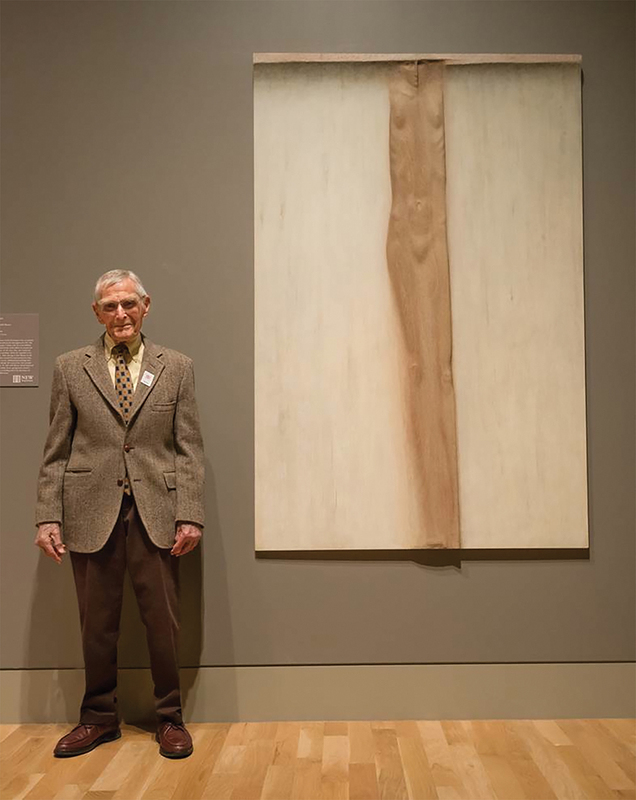 The sculpture-painting, “The Figure Rising,” by artist James Hueter has been acquired by The Huntington Library, Art Collection and Botanical Gardens in San Marino, CA, for their permanent collection of American Art. James studied art at Pomona and received his M.F.A. at CGS. He has been an active artist since then and continues to show and work. A 60-year retrospective of his work, curated by Steve Comba, associate director of Pomona College Museum of Art, was shown at the Claremont Museum of Art in 2009, and he will have a show at Bunny Gunner Gallery in Claremont in May 2016. See photo of James with his work at the Huntington. He and his family had a private tour of the gallery space in Jan. with Hal Nelson, curator of Decorative Art, and Jessica Todd Smith, chief curator of American Art. A new work by Linda Kawasaki Yoshizawa ’78 was included in the visual arts portion of the 10th annual “East Meets West” art and poetry exhibit, integrating visual and literary arts, held in the Civic Center at the main Livermore, California, library. Yoshizawa is a printmaker from the San Francisco Bay Area whose artwork reflects the mixing of two cultural sensibilities—American and Japanese. Her nature-inspired drawings are used as symbols of our own struggles and yearnings. She uses colors, values, and textures to elicit mood, questions, and a sense of serenity. Her monotype printing technique balances serendipity and design with a personal aesthetic that reflects her Japanese-American identity. An art major at Pomona, she is a member of the California Society of Printmakers and the Los Angeles Printmaking Society. Her work is included in many personal and corporate collections across the country, including Kaiser Permanente in San Ramon and Pleasanton, California. 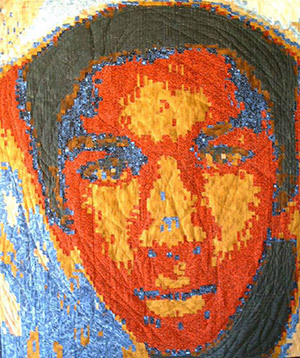 “AMERICAN SPRING, A CAUSE FOR JUSTICE,” 23 story quilts that narrate the Trayvon Martin shooting in Florida, will be on display at Pomona College, beginning Feb. 23. 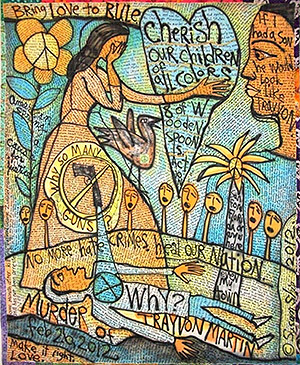 The quilts come from the Fiber Artists of Hope Network and reveal reactions to Martin’s death in 2012 and hopes for a better America. The exhibition will be open Feb. 23 to March 8, 2015, at the Pomona College Bridges Auditorium (450 N. College Way, Claremont) and is free to the public. An opening reception will be held on Thursday, Feb. 26, with lectures at 6 p.m. and the reception at 7 p.m. 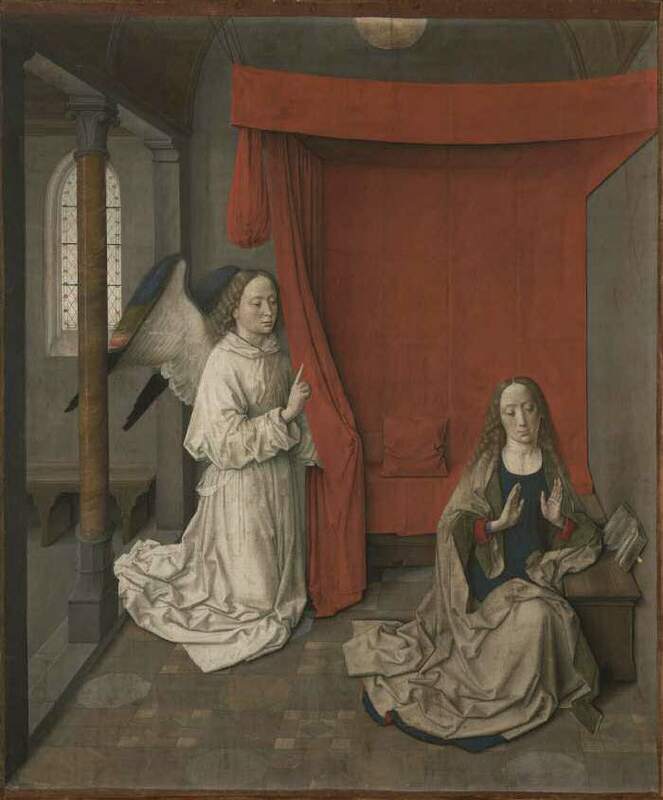 The exhibition is open on Monday–Wednesday and Friday-Saturday, from 10 a.m. to 4 p.m. On Thursdays, the exhibition will be open 1-7 p.m. in connection with the Pomona College Museum of Art’s Art After Hours program. On Sundays, the exhibit will be open 12-3 p.m.
Story quilting expands on traditional textile-arts techniques to record, in fabric, events of personal or historical significance. Through the accessibility of their colors, patterns and symbols, the quilts of ”American Spring: A Cause for Justice” relate narratives that enable conversations about sensitive topics from our national history, furthering the discussion of racial reconciliation in America. This exhibition is curated by Theresa Shellcroft and is organized by the Fiber Artists of Hope in Victorville, Calif. The quilts have been exhibited to the Congressional Black Caucus, in Atlanta, Baltimore, Little Rock, Los Angeles, Marion (IN), Philadelphia, Victorville and Washington, DC, among other locations. Associate Dean Jan Collins-Eaglin saw the quilts at the African American Quilting Guild meeting in Los Angeles last year. “Each quilt tells a story,” she says. 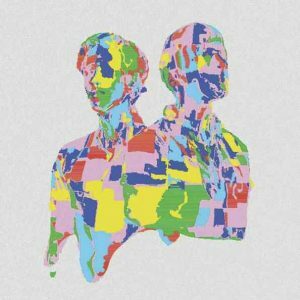 “They’re very evocative and interpretations of what happened. I really wanted our students to be able to see them. Then there were the shootings of Michael Brown in Ferguson and Eric Garner in New York.